On Friday night, May 25, The Star Beach Bar and its extended family say ALOHA by welcoming summer travelers and locals for a soft opening for regular business. Patrons will get a sampling of the magnificent beach view, succulent food offerings and interactive family fun that ICONA’s newest beach concept has to offer. Live entertainment starts at 4PM with an acoustic Duo! 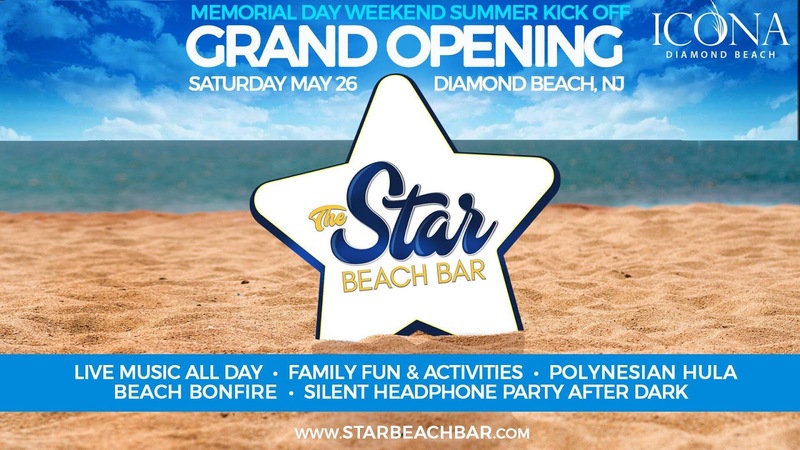 The fun continues on Saturday, May 26 with the official Grand Opening of The Star Beach Bar. DJ Mark Anthony will be hosting “ICONA Olympics” starting at 11 am, keeping families entertained all day long with your favorite beach games. There will also be a sand castle artist bringing to life some of the most amazing beach creations on the East Coast. The Passing Paradise Duo will perform at 4 pm. As day turns to dusk, don’t miss out on the first of many annual lighting of the STAR ceremonies which will include a champagne toast at 9 pm, an authentic Polynesian Dance Show courtesy of Paradise Island Entertainment and a red carpet photo experience! The weekend’s festivities continue on Sunday with ICONA Olympics at 11 am and Reggae Sundays at 3 pm as The Star Beach Bar unveils it’s Every Sunday Funday program!